COBie takes intelligent information, which identifies where any number of components are located in a building and the hierarchical relationships between them, and puts it in an accessible, specifically formatted, easy to understand spreadsheet. However, this remains a separate handover from the 3D model, something that goes against the flow of BIM’s drive for collaboration and greater efficiency. 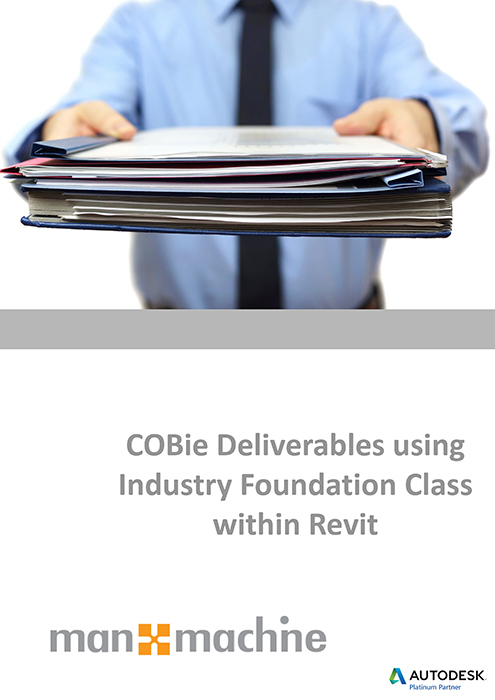 This ebook, from Man & Machine, looks at a different way of doing things – realising COBie deliverables using Information Foundation Class (IFC) within Autodesk Revit. The IFC file contains a full understanding of each individual component within the 3D model and all the hierarchical relationships throughout a building. On demand, it can instantly display any amount of data from the Information Model – the components within a space, the systems they are connected to and what is driving them. In short, the IFC file does what COBie sets out to do but in a way that is fully linked to the intelligent, data-rich 3D model. The ebook highlights Revit’s free COBie Extension and Classification Manager, which can be used to build up COBie and object classification, as well as the regularly updated IFC Exporter for exporting directly out of Revit. Using the IFC within Revit offers the option of harnessing all the data and power of the 3D model without losing the possibility of integration with other systems and, ultimately, provides for an information-rich, intelligent handover.